19 years ago - 17-year-old Imra Ardeen appears in Smallville along with Rokk Krinn & Garth Ranzz to save Clark Kent from a time-displaced Brainiac 6.0. 2975 - Imra Ardeen is born on Jupiter's moon, Titan. 2983 - 8-year-old Imra's powers manifest, marking her as a mentalist. 2987 - 12-year-old Imra earns a place in Titan's mentalist temples, training to become an oracle. 2990 - 15-year-old Irma, Rokk Krinn & Garth Ranzz save RJ Brande from an assassination attempt, and decide to form the Legion of Super-Heroes. She becomes Saturn Girl. ​2992 - 17-year-old Imra participates in Querl Dox's temporal experiment, going back in time to stop Brainiac 6 from killing Clark Kent. 2996 - 21-year-old Imra becomes the leader of the Legion of Super-Heroes after Lyle Norg steps down. ​2997 - 22-year-old Imra is one of the only people that know that Jo Nah is infiltrating a notorious criminal organization. ​2998 - 23-year-old Imra summons Garth Ranzz from several systems away to save the United Planets from destruction. 3000 - 25-year-old Imra is stranded in a distant galaxy with a group of Legion of Super-Heroes members. She helps keep her teammates calm, forcing her to assume the burden of their strain. Before Garth Ranzz sacrifices himself to send them home, she accepts his long-standing affections, taking his name posthumously & returning to the temples of Titan to recover from her strain. 3005 - 30-year-old Imra answers the call to reunite the Legion of Super-Heroes & stop the Dominators control of Earth. She is no longer able to speak. 3006 - 31-year-old Imra opens up to Jo-Nah, beginning to reclaim her humanity. 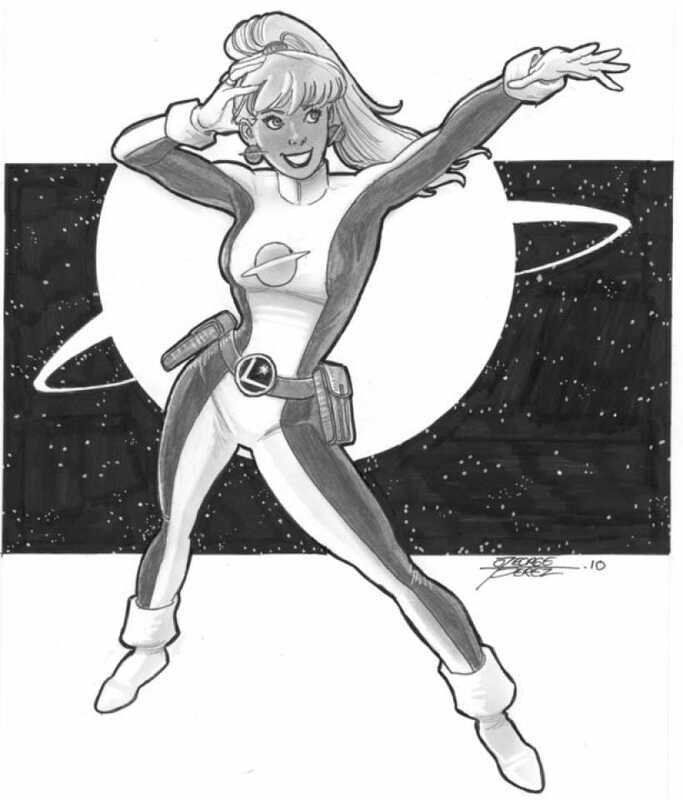 Saturn Girl is a really intertesting entity, because while her status as a member of the Legion of Super-Heroes has kept her more or less in the background of DC for most of her existance, the fact remains that she is one of the longest-running female superheroes in comics. She suffered some of the same indignities that many other female superheroes did, but in many ways she was also shielded from them because she was so defined as a member of her team first. For example, a quick google image search will show you here pink super-sexualized bathing suit costume that she wore for years... but you'll also discover the costume Cosmic Boy wore during the same period. The idea that a male character would experience the same fetish-costume treatment as his female counterpart is just wild. 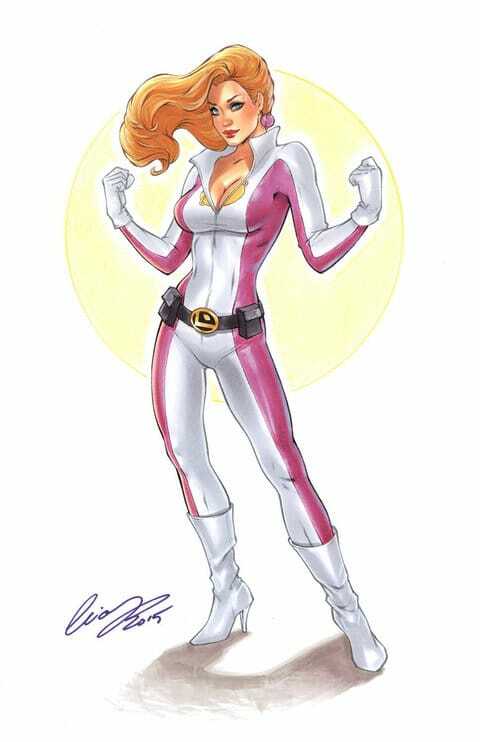 Likewise, while many female characters were forced to represent womanhood as a general idea and therefore weren't really free to develop their OWN identity, Saturn Girl was essentially set up with her own personality from the get go. Like all the members of the Legion, there have been many versions of the character, but there's a consistent sense of her as a compassionate, capable woman who develops over time into a powerful hero who is competent stepping up as the teams leader. In a lot of ways, you could argue that she's the heart of the team.